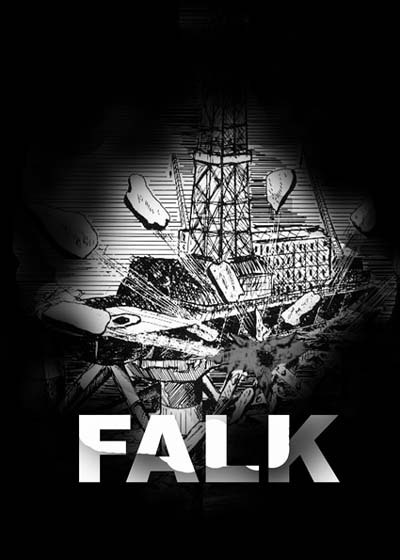 Filmed on location in Norway, ‘Falk’ interprets a real-life story of one man’s search for justice that stretches over time, crosses continents, implicating terrorists, the mafia, state, corporate and police organisations, clandestine networks of resistance and subterfuge. The old left are now the new right, power is increasingly unstable, and private criminal wills are the authors of communal justice. Such ‘conspiracy theories’ that schematise the status and mechanisms of power give rise to a specific culture of conviction that has the force of the strongest types of metaphor – those that are empty. This is a culture of politics where justice is achieved when truth is proven; an en-culturing that is tangential to political order and yet is central to it and authored by it. It is here where politics grounds new truth claims, where the achievement of impact is the getting of power. Contributors: Amanda Beech, Roman Vasseur. Falk, 2006 Still, single channel video. 2015 Yarnwork, Screening, Bergen Kunsthall, Bergen, Norway. Curated by Robin Mackay. 2015 Politics of Amnesia 2 Group exhibit, Café Gallery, London, UK. Curated by Richard Ducker. 2010 The Mortar of Distribution, Group exhibit, LoBe Gallery, Berlin, Germany. Curated by Matthew Poole.